I currently serve on the Executive Committee (Secretariat) of the Association for Critical Heritage Studies (ACHS). 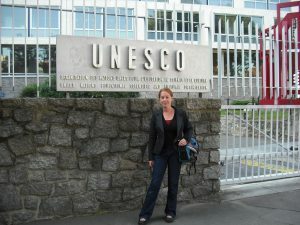 Past and current associations include serving as an advisor for IUCN Commission on Environmental, Economic and Social Policy (CEESP) and as an Expert Member for ICOMOS on the International Committee on Archaeological Heritage Management (ICAHM) Committee (20008-2014). I was also involve with the Intellectual Property Issues in Cultural Heritage (IPinCH) from 2010-2015. As a graduate student I served on the SAA Native American Relations Committee of the Society for American Archaeology (1999-2004). At Michigan Tech, I am the Undergraduate Director for Social Sciences and a member of the Graduate Dean Awards Advisory Committee. I also serve on Undergraduate Student Learning Goals (USLGs) Information Literacy Committee. I was a representative on the Graduate Faculty Council.